You may choose become an Advanced UConn Master Gardener by taking additional Garden Master Classes. To become a UConn Advanced Master Gardener, you must take 20 classroom hours of Garden Master Classes. Hot Topics class, which is required annually and free, counts toward UConn Advanced Master Gardener class hours. For those who choose to pursue Advanced status or who enjoy taking classes in horticulture and natural resources, we offer the Garden Master Classes. The Master Classes help maintain and grow the program as well as offer educational opportunities. The Advanced Master Gardener program, like the Master Gardener program, is not free and has never been promoted as such. The revenue from class fees helps pay for coordinators and instructors, materials and rental fees and all the other costs associated with running a program. The UConn Master Garden Program receives a modest Smith-Lever grant from the federal government each year but relies on self-generated tuition income for the significant majority of its expenses. We have long-standing arrangements with a very few other groups to provide some Advanced Master Gardener credit for their activities (e.g., the annual Connecticut Master Gardener Association symposium and the biennial Connecticut Invasive Plant Workgroup Symposium) but simply cannot afford to accept for Advanced Master Gardener credit other classes, seminars, or workshops that are not vetted and do not directly generate revenue for the UConn Master Gardener and Advanced Master Gardener programs. Spring and Fall Garden Master Class catalogs are published in January and September of each year. Classes vary. 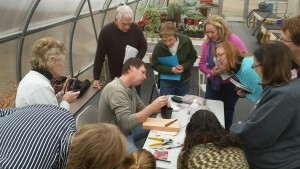 Most Garden Master Classes are two hours in length and cost $40 for UConn Master Gardeners. Garden Master Classes are open to the public for a slightly higher fee. If you continue to take advanced classes, you can earn bronze, silver, and gold levels and attain additional levels of Advanced Master Gardener status.